What do you know of this guitar? RichwoodMy friend recently purchased an entry-level Richwood RM 140 NT. I'm curious about this guitar, my friend is new to GJ and I'm not a guitarist. 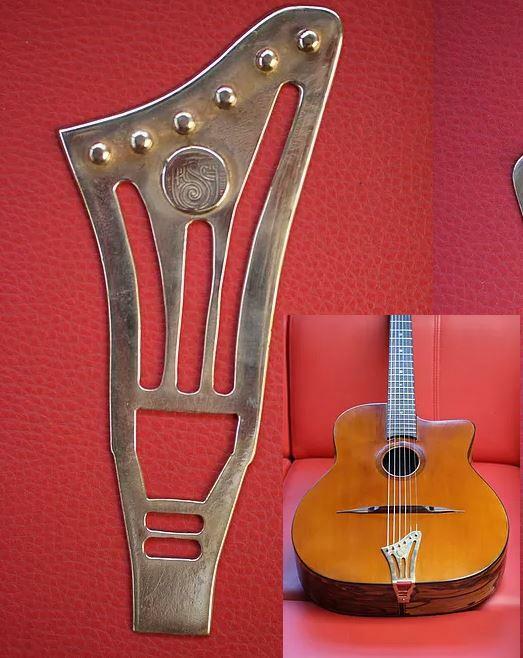 What do you think of this tailpiece ? 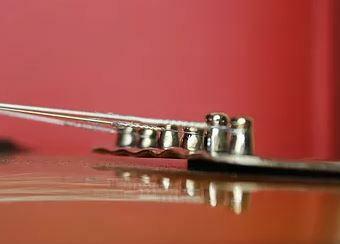 "increase tone and brilliance while reducing string tension. Angled compensation and staggered peg height for the best possible sound and playability." What are your thoughts about this ? Will it work and if so how ? I love the look. Might get one. How it could change the things he says it does, that I can't see. Here's what I (a total amateur) think: by decreasing the after-length of the G, B, & E strings (relative to the standard-form tail piece), these strings would feel stiffer, or maybe better said, less-slinky/bendy than normal. The fact that the post heights are lower as the total string length shortens just acts to keep the break angles relatively constant. Ordinarily, the G,B &E strings get progressively longer after the bridge, and a constant loop-post height would essentially increase the break angle and therefore the downward pressure on the top (and thus the volume). But by keeping the absolute loop-post height constant & break angle constant, the volume of the G, B, & E strings should be progressively quieter than normal. So overall, this tailpiece may tip the balance in sound/ volume towards the E, A, & D strings, while decreasing the bend-ability of the G, B, E strings slightly. Just my opinion. The factors for string tension are string mass and length between nut and bridge. For any given string on a given scale length, the longitudinal tension to bring it to a specific tuning will be the same regardless on what is happening outside of the nut and bridge. With a greatly increased break angle the total string tension would I think have to be greater as break angle determines how much of the pressure gets transmitted downward. Won't affect string tension. Sorry. Looks cool though. Kinda like necks and bridges, I feel like you want the tailpiece to be as stiff (and light) as possible. No point using up the little energy that your pick puts into the string by wiggling anything besides the soundboard. 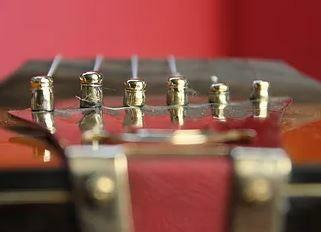 I've made similar tailpieces out of solid brass like that for archtops. I bit the bullet and ordered one. I'll let you know how it works once I've fitted it. One thing I just thought about. The high posts on the bass side probably don't really do anything either. The line between the top of the bridge and the edge of the guitar at the tailblock will pretty much make a straight line (give or take depending on the bending stiffness of the tailpiece) since a string can't support lateral forces. That is why the tailpiece looks twisted in the picture looking from the tailblock toward the bridge so I don't see the point of the taller posts but I may be missing some second order effect.